This is where you will find everything that you need to know about supporting the Coastguard Association. We rely solely on your donations, legacies and every penny raised via PR’s / Events / Collections to help Coastguards in need of assistance. 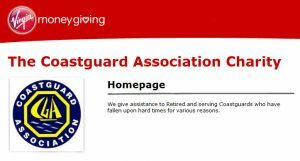 Any help is greatly received as the Coastguard Association is a small but growing charity. There are many ways that you can help our charity support Coastguards in need. From something simple like making a donation to something more active like a sponsored event or an unusual fundraising idea. But without your help we wouldn’t be able to provide assistance to these men and woman who are on call 24/7 to keeping our coastline safe, in their time of need. So what can I do? Well you can Bike Ride, walk, silence, swim, slim, head shave, parachute jump, the skies the limit! There are numerous sponsored events you can do – and they are all a great incentive to try something new or to achieve a personal goal, as well as helping to support the CGA. We have a Just Giving page and it is really easy for you to run your own event or sponsor us online – or just send us a donation. If you would prefer a paper Sponsor Form, you can download one – or if you email our National Secretary to personalise one for your individual event. Your can find more fundraising ideas here. It’s amazing how the pennies can pile up. So why not help Coastguards by collecting your loose change in a CGA collection box? There are two types of collection boxes: one you can have at home and the other can be displayed on a reception desk at work, or even at your local pub or social club. However you collect the money it will all go towards helping to support the Coastguard Association. If you would like to request a home collection box or a reception desk collection box, simply email chairman@coastguardassociation.org.uk and request one – don’t forget to include your contact details in the email. Nominate the CGA at your local Waitrose store or donation scheme as the charity you feel should benefit more – we are delighted when local carnivals, stores and businesses choose us as their charity of the year – thanks to your nomination – and we are happy to provide you with any resources or advice that you need to maximise this potential.